Most IT admins will agree that patching systems such as Windows clients and especially Windows servers involve some degree of risk. If you’re not convinced of this, take a look at my earlier article titled Have Microsoft patches reached a painful tipping point? here on our TechGenix site. In that article. I shared some stories that demonstrated that the pain of keeping up with the sheer number Microsoft patches has become unbearable for many admins, and I concluded that something has to change, and soon. Then in a follow-up article titled I described a bunch of mitigating steps we can all take as patch management admins to stave off impending doom. These steps were basically practical tips such as waiting a week before applying any software updates and using several reliable sources to review all the known issues concerning the updates you are going to deploy. While the steps I outlined can be of practical help for patch management admins, they don’t deal directly with the core issue of risk. What I mean is that each time you apply a newly released update to an operating system or application to address some security or reliability issue with the software, you risk having something unexpected happen. Like breaking the application you’re trying to patch. Or breaking the networking capabilities of your platform. Or breaking a workflow between several applications and services. Or breaking some legacy code or script your business relies upon. Or possibly even ending up with a dreaded blue screen stop error on one or more of your patched systems. The list of risks you might be exposed to when it comes to patch management is endless. And I don’t say this idly as we all as admins have had major snafus happen to us in the past where something went fubar because of applying a patch a vendor released for some application or operating system. What this means, of course, is that fundamental to the whole process of patch management is the concept of managing risk. 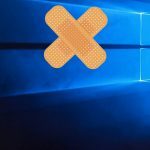 But given the wide range of possible negative outcomes that might occur each time you apply a patch released by a vendor — and especially patches released by Microsoft for its Windows operating systems if your applications and services all run and rely upon Windows client and server systems — where should one start when it comes to managing the risks involved in patch management? I recently had a discussion about this with Emin Atac, a certified Digital Forensics and Incident Response (DFIR) professional and a Cloud and Datacenter Management (CDM) Microsoft Most Valuable Professional (MVP) award recipient. Emin blogs about his Information Security (InfoSec) and Automation journeys on his WordPress site, and he shares his projects on his GitHub page. In a nutshell, Emin’s approach to this matter is simple and clear: “My strategy has always been a risk-based approach. If there is a vulnerability, something needs to be done about the risk. But the risk needs first to be identified and assessed.” In other words, the key first step in managing risk for patching systems is to identify what kind of vulnerability a patch is designed to fix. Then based on the degree of seriousness of the identified vulnerability, you can then decide upon what level of risk is involved in applying (or not applying) the patch, and also how and when you should apply the patch. What this boils down to in Emin’s estimation is that there are basically four different ways you can deal with a vulnerability when it has been identified for an operating system or application. First, you can accept the risk as being slight at present and just file the information away for a future time when the vulnerability becomes a zero-day exploit should that ever occur. I asked Emin for an example of this type of vulnerability and he mentioned Matt Nelson’s blog where he described a remote code execution vulnerability he had identified back in February 2018 whereby the Windows Shell didn’t properly validate file paths. This meant that an attacker who managed to successfully exploit the vulnerability could run arbitrary code in the context of the current user. Matt reported the vulnerability to the Microsoft Security Response Center (MSRC) and the end result was that the MSRC released a fix for the issue in August which by then had by then been designated by MITRE as vulnerability CVE-2018-8414. Although Matt had proposed some ways of monitoring one’s exposure to the vulnerability and had also suggested an (untested) workaround for reducing your possible exposure to it, most admins probably dealt with the matter by accepting the risk of doing nothing until a patch was released as being sufficiently small to warrant such a decision. The fourth and final approach to patching vulnerabilities that Emin identifies is to simply avoid the risk associated with the vulnerability by either patching it immediately or — as a drastic resort — by removing the offending software or Windows component from the exposed systems. For example, if a serious zero-day vulnerability was identified in Adobe Acrobat for which Adobe has not yet released a patch, you could decide to simply uninstall Acrobat from all client systems and install a different PDF reader program instead in its place. As an example involving a Windows component, Emin mentions that he "removed SMB v1 six months before there was Wannacry (see here for how to do this) and immediately applied MS17-010 to fix the Ethernalblue vulnerability CVE-2017-0144." Accept the risk for now and wait for Microsoft to release a patch for it. Reduce/mitigate the risk by applying the workaround (if any) that Microsoft recommends until you have time to fully evaluate the risk associated with applying the patch itself. Share/transfer the risk by pulling out your wallet and calling your insurance company. Just apply the patch to avoid getting nailed by the exploit identified by the MSRC advisory. Naturally, each vulnerability, workaround, and patch has to be dealt with separately to determine which approach is best in terms of its risk for your environment.